The Winthrop Center site once housed a city-owned garage. This is the first in an occasional series on the construction of Winthrop Center, a 691-foot-tall office and condominium tower being built on the site where the Winthrop Square garage once stood. 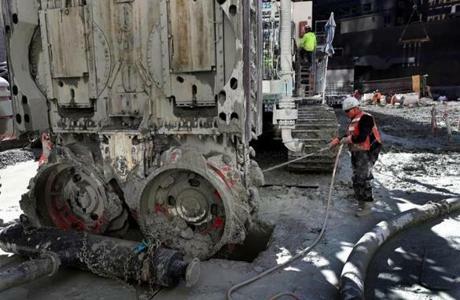 The $1.35 billion project broke ground last fall. When it’s completed — about three years from now — Winthrop Center will be the city’s fourth-tallest building. 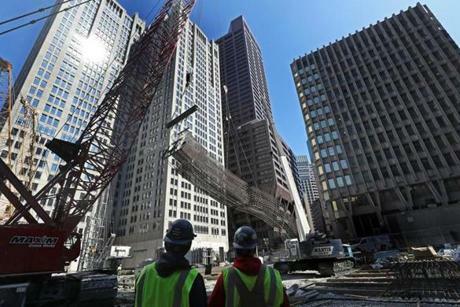 On a cramped, T-shaped piece of property in Boston’s financial district, a skyscraper is being born. Crews are hard at work on the foundations. They’re using machinery to create a concrete wall that will form the basis of the building’s exterior and digging deep shafts into the earth that will house the roots of the foundations. Winthrop Center will feature two glass-and- concrete spires full of office space and condos stacked on top of a massive ground-level hall that will connect Federal and Devonshire streets. Between residents and office workers, Winthrop Center will be filled with as many as 6,000 people a day — about the population of Dover. “You’re talking about enough critical mass to create a neighborhood,” said Kathleen MacNeil, who is overseeing the project for the developer, Millenium Partners. At the moment, however, the site is more like an obstacle course. The ground is an almost primordial muck — water and dirt and clay combined into a substance capable of swallowing boots well above the heel. Construction crews make sure to wash the mud from their boots and equipment before exiting the site. Parts of the site are marked off with flags. Each one designates a no man’s land, a perimeter erected around heavy construction vehicles that prowl like mechanical dinosaurs. Three of these vehicles are busy digging trenches. Two are equipped with “clamshell buckets” that scoop out huge chunks of earth. A third crane carries a piece of equipment called a hydromill. It comes in when the others reach rock that’s too hard for them to remove, grinding it up with saw-like teeth. The hydromill’s head weighs 40 tons. “They don’t necessarily see you, so you have to see them,” Roy Greenhalgh, general superintendent for Suffolk Construction, warned during a recent tour of the site. Suffolk is the project’s general contractor. Once the foundation is built, construction work will proceed simultaneously below and above street level. In all, the project is expected to take about three years. Construction vehicles aren’t the only things that require a perimeter: The border with neighboring Winthrop Park is fenced off, and trailers guard an opening in the fence as if it’s some kind of demilitarized zone. Below that fence is a section of reinforced wooden boards meant to keep the park and the street it’s on from sliding into the sunken area that’s being carved out during construction. Once complete, Winthrop Center will be less than 20 feet from its closest neighbor. The proximity caused some property owners to raise concerns that construction could threaten the integrity of nearby structures. To alleviate those fears, Suffolk decided to make the building’s concrete exterior wall a foot thicker where it abuts other buildings — four feet wide instead of three. There are also multiple procedures to keep the area around the site clean. Wheels and boots headed onto city streets get hosed down, and equipment is constantly sprayed with water to keep it from splashing mud on neighboring buildings. In many ways, the work on Winthrop Center is still in its infancy. At the moment, the focus is on installing rectangular supports — known as load-bearing elements — that will withstand the building’s weight. In many ways, the work on Winthrop Center is still in its infancy. To create one, cranes lower a cage-like metal skeleton into one of the excavated shafts, which is then coated in concrete. Massive steel columns, called “stingers,” will slot into the load-bearing elements, further reinforcing the building’s structure. Each stinger weighs 3 to 25 tons. The work is projected to last about three more years, with office space opening in summer 2022. Millenium has not specified when condominiums will be available. Work on the foundation will continue until September. After that, construction will proceed both above and below street level, a process known as the up-down method. Greenhalgh said that working in both directions simultaneously will shave three to four months off the project’s timeline. 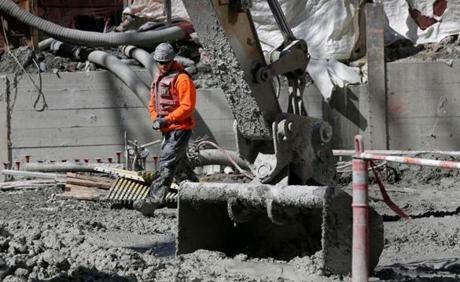 Crews will excavate the basement’s lower levels even as work starts on the first floor, which will extend between Devonshire and Federal streets. John Newhall, Suffolk’s senior project manager, said that part will be especially difficult. But that stage of construction is still a ways off. 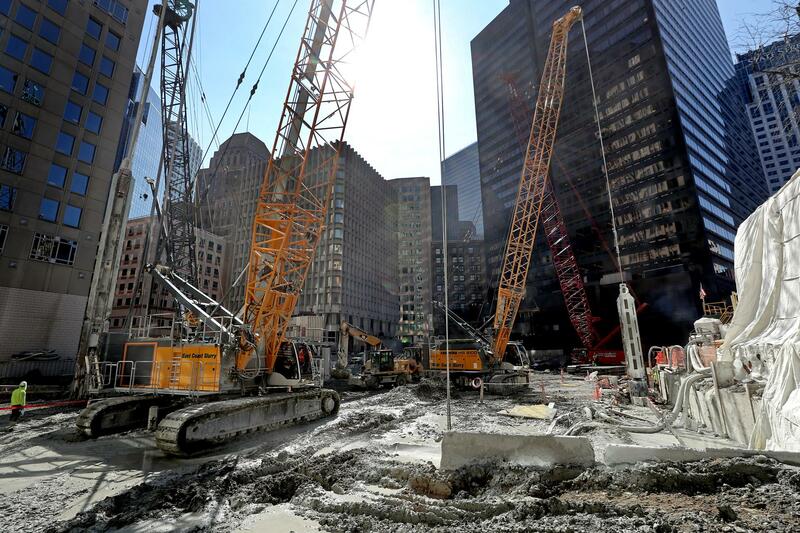 For now, the crews are concentrating on building a foundation strong enough to support a new piece of Boston’s skyline. 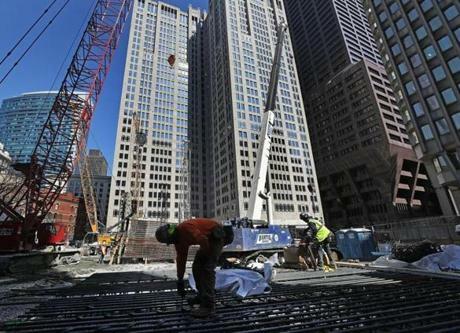 Winthrop Center will be tucked between other downtown Boston buildings near Winthrop Square.